Once again, there’s a new little theater in town. Matchbox Theater used to be in Alberquerque, New Mexico, but has now migrated to the Twin Cities. 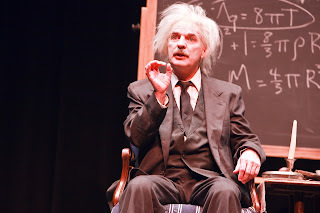 Their inaugural production is Tom Schuch performing Willard Sims’ one man biographical play Einstein: A Stage Portrait, about the life and times of times of Nobel Prize-winning physicist Albert Einstein (whose name has become synonymous with the idea of genius). A German Jewish scientist who resettled in America during the rise of the Nazis in his home country, Einstein’s theory of relativity lead to the development of the atomic bomb. Einstein greets his audience and sets about recounting highlights from his colorful life. It’s a selective portrait, but amiable enough. Schuch does a good job embodying Einstein (not surprising, since he's been touring this show nationally and internationally since 2001 - Einstein's like an old friend to him at this point) and the script does an adequate job of trying to encompass a man’s life in about 90 minutes time. This Einstein does what any good stage play about a real person should do, make you want to find out more for yourself. Early on in the proceedings, this stage Einstein says he wants to set the record straight, but it’s never entirely clear what he’s trying to clear the record about. Yes, mention is made of the fact that he’s considered by some to be the Father of the Atomic Bomb because of his theories. But he himself wasn’t anywhere near Los Alamos when the Manhattan Project was in process, because he was a pacifist and, since he was also a socialist, J. Edgar Hoover’s FBI file on Einstein was quite thick. Einstein did write a letter to President Roosevelt urging America to develop the bomb before the Nazis had the chance to finish their work on the same project. But Einstein was just as horrified by the death and destruction when America dropped the atomic bombs on Hiroshima and Nagasaki in August 1945 as he would have been if the Nazis got the capability first. In fact, two years later Einstein helped found the Emergency Committee of Atomic Scientists and did his part to discourage further use of nuclear weapons. Though any time spent with Einstein is time well-spent, it’s hard to understand why this play takes the shape it does. What is the urgency here? Certainly a discussion of the uses of and need for science, and how governments both help and harm that quest for knowledge, is relevant to where we are today. Discussions of fascism and the rise of the Nazis are also, unfortunately, not as removed from current events as we’d like. But a lot of this is pretty free-floating and easygoing. I kept getting drawn back to what one of my teachers once referred to as the Passover question as it applies to plays - why is tonight different from all other nights? Why are we telling this story, in this time and place, in this way, now, to this audience? 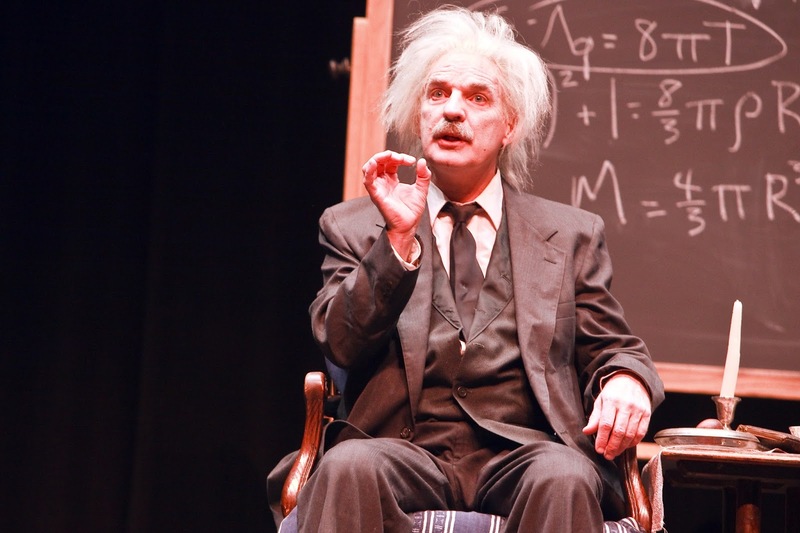 In Einstein: A Stage Portrait, the answer to those questions are not easy to get a handle on. Einstein tells us the year we’re meeting him is 1946. But the play doesn’t do a very good job of putting that in context. It’s ten years after the death of his second wife (though that doesn’t seem to be significant to the play). It’s nine years before Einstein himself will die at the age of 76 (though again, same note). It’s perhaps not even a year since the atomic bomb was dropped on Japan, bringing an end to World War II. Here, Einstein is troubled in his dreams by what his theories had a hand in creating, but the play doesn’t seem to focus much on that either. It doesn’t really seem to focus on anything more than giving a general travelogue through various points in the life of Einstein from childhood to the day we meet him. When you type Einstein and 1946 into a basic internet search, you find him on the cover of Time Magazine, his face painted next to a mushroom cloud with his famous E=mc2 formula inside it (which he must have “loved”). You find mention of a lecture he gave when receiving an honorary degree from Lincoln University. And you find an article he penned on racial bias in America (he was a member of the NAACP, and drew a lot of parallels between the treatment of the Jews in Germany and “negroes” in the U.S. He looked at racism like a disease infecting a country, a disease that could hopefully be eradicated.) Not much of that figures in the play. The play also doesn’t seem particularly preoccupied with Einstein’s personal life. Passing reference is made to his two wives and his children (what must it be like to be Einstein’s children?) No mention is made of his womanizing, or the fact that he was carrying on an affair with the woman who would become his second wife at the same time he was in the process of divorcing his first wife. I’m not arguing for a lurid TV-movie version of his life by any means. I’m more interested in the life of the mind this play is also more intent on pursuing. But it’s interesting how this script skillfully avoids dwelling on the man’s family life for fear of being pulled down that particular rabbit hole of distractions.